Chuck the Lazy Isopod is still one of my favorites. But I also liked Bottle of Thunder and Land of Doom (both years, and I secretly hope to see a Burger Bug feature here someday) and that crazy unfinished one about the giant plant. And probably more, too, but it is too late at night for me to dig deeply in the well of my memory (it can get pretty spooky down there, and I don't have a nightlight). I'm super excited! And I'm rooting for you! Thanks everyone. I totally set this all up to get you excited for summer. I, uh, had it all planned out. Yeah. That's the ticket. Thanks for sticking with it. I enjoy it very much. You can do it! YES! Your blog is my favorite. And I totally dreamed about mermaids last night. I was in a class, like a high school class, and you were the teacher, and you passed out an assignment and they were drawing of mermaids from the Mermaid Fire Brigade. I did half a load of laundry yesterday and downloaded a new game onto my Android. Thank you, Nathan Hale, God of Everything that is Artsy and Awesome! Just thought you'd like to know that your Busy Octopus graces my computer desktop. And what's with the R in MTWRF? 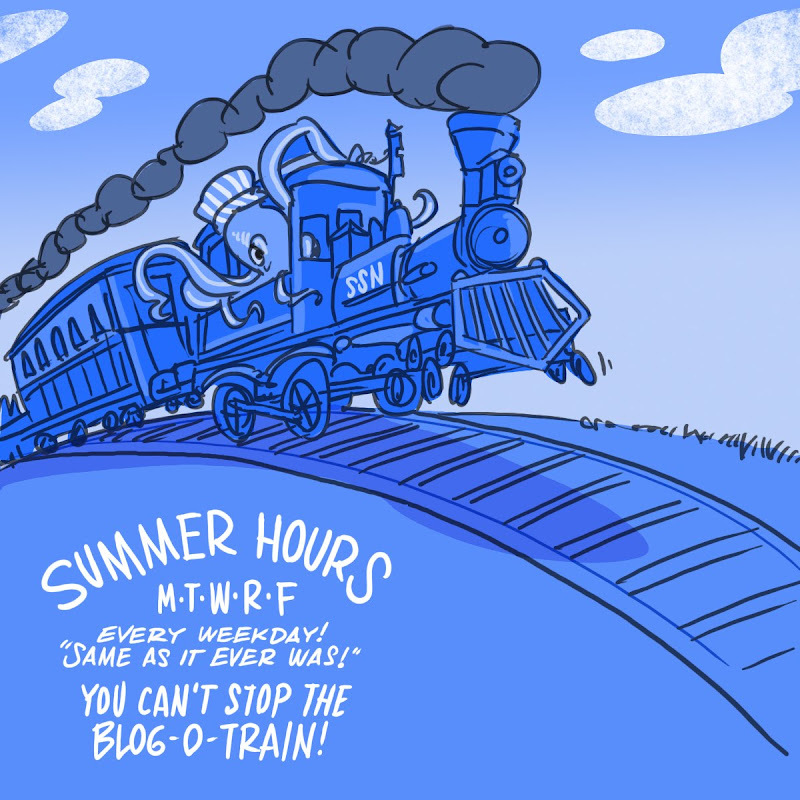 First thought on new header: New picturebook: "Don't let the Octopus Drive the Train." Also am thankful that I'm no longer an art director trying to persuade you to squeeze another CRICKET assignment into your already full summer schedule... I would feel SO guilty (or sad because you're probably better about saying "no" to the little projects now). Hey, a CRICKET reunion is happening in here! Miss the CRICKET days--those were the funnest jobs. I was wondering about the "R" too.